From its inception, exposure and response prevention (ERP) therapy has been mainstay of cognitive behavioral therapy (CBT) for obsessive-compulsive disorder (OCD). Theories and mechanisms behind its success were evaluated and revised from time to time. Initially, the primary theory behind exposure has been emotional processing theory (EPT) which emphasized fear habituation as one of the primary underlying processes. Despite the outcomes of EPT-based ERP focus, many patients were nonresponders and some of those who respond experience at least partial relapse at later follow-up assessments., Given these shortcomings, further studies were conducted to determine how to optimize the effects of ERP. Some have highlighted the limitations of EPT-based exposure therapy notion of breaking of conditioned fear responses through habituation. Laboratory research on fear extinction indicates that these associations do not break or disappear; rather exposure therapy leads to the learning of new nonthreat (i.e., inhibitory) associations that compete with older threat associations. EPT points that the effects of exposure therapy derive from the activation of a “fear structure” and integration of information that is incompatible with it, resulting in the development of a nonfear structure that replaces or competes with the original one. Incompatible information derives first from within-session habituation or reduction in fear responding with prolonged exposure to the fear stimulus. This incompatible information from within-session habituation is seen as a key and prerequisite for the consolidation of additional incompatible information from between-session habituation. Between-session habituation is purported to form the basis for long-term learning and to be mediated by changes in “meaning” or lowered probability of harm and lessened negativity of the stimulus. Although enticing in its face validity, support for EPT has been inconsistent at best. The main criticism behind this approach is that a sizeable percentage of patients (14%–31%) are classified as nonresponders,, and of those who respond, up to 50%–60% experience at least partial or return of fear in follow-ups., The mean nonresponse rate is a full 50% at post-CBT and 49% at follow-up, in studies published since 2000 for anxiety disorders. In other words, almost one-half of the patients remains symptomatic. To find answers for the above-mentioned drawbacks in given ERP model, there has been persistent research to find strategies for optimizing it. Various researches led to a finding that inhibitory learning is central to extinction, although additional mechanisms, such as habituation, may be at play as well. In the previous conditioning approach, the inhibitory learning models mean that the original conditioned stimulus (CS) - unconditioned stimulus (US) association learned during fear conditioning is not erased during extinction, but rather is left intact as a new, the secondary inhibitory learning about the CS-US develops. The new inhibitory association is dependent on both the CS and the context in which the CS is presented whereas the initial excitatory association is independent of context. Bouton et al. propose that after extinction, the CS has two meanings; one its original excitatory meaning (CS-US) and the other additional inhibitory meaning (CS-no US). In other words, instead of weakening of the original fear memories, it is now believed that the establishment of new memories that effectively compete with the original fear memories for control of emotional responding is central to extinction. Corroborating evidence from neurobiological studies of fear extinction lends support to this view. Followings are the mechanisms believed to hinder in the consolidation of learning in EPT model of ERP. First, the time factor, conditional fear is associated with spontaneous recovery, meaning that following an interval of time between extinction learning and poor practice may account for relapse. Second, renewal of conditional fear is associated with change of context, it occurs if the variety in learned context is different than retest context. The extinction context does not become a general inhibitor or safety signal because nonextinguished stimuli retain their value when tested in the extinction context. Third, reinstatement of conditional fear occurs if unsignaled (or unpaired) US presentations occurred out of blue or in between extinction and retest. The clinical implication of reinstatement is that if any adverse events happened after exposure therapy may lead to a return of fear of the previously feared stimulus if it is encountered in an anxiety-inducing context. For example, fear of contamination may resurge after being physically ill due to adverse weather conditions. Fourth, rapid reacquisition of the conditioned response is seen if the CS-US pairings are repeated following extinction  being more rapid than the original learning indicates that the carryover effects of the original acquisition learning. Hence, robust clinical value is believed to be there in optimizing inhibitory learning during exposure therapy to both enhance treatment efficacy. An exposure model that takes this application of inhibitory learning into account has the potential to offset the negative effects due to spontaneous recovery, renewal, reinstatement, and reacquisition. The goal is to enhance inhibitory learning during exposure therapy, and to enhance its retrieval following completion of exposure therapy in as many circumstances as possible. Inhibitory learning theory (ILT) provides a novel foundation for understanding how exposure therapy can be maximized to overcome such deficits, but has not been adequately studied and compared to other evidence-based management in OCD. 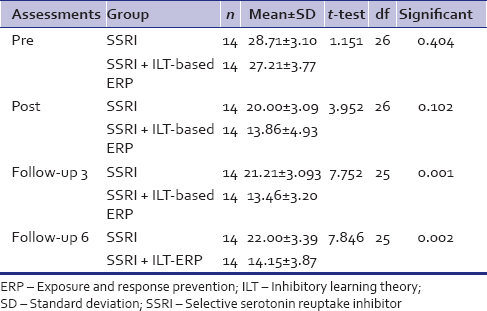 Given the above, the present study was undertaken to compare ILT-based ERP plus selective serotonin reuptake inhibitors (SSRI) with only SSRI treatment in OCD patients. The present study is pretest/posttest control group design, with random allocation, single masking (outcomes assessors). Consecutive patients with the diagnosis of OCD attending Outpatients Department of Mental Health Institute, SCB Medical College and Hospital, Cuttack, Odisha, selected on the basis of following inclusion and exclusion criteria. Aged between 18 and 40 years. It was the primary outcome (PO) measure. Yale-Brown obsessive compulsive scale (YBOCS) is the most widely used clinician-rated interview to assess the severity of OCD symptoms.,, The 10-item semi-structured clinical interview version was used. Each item is rated on a five-point Likert scale from 0 (no symptoms) to 4 (severe symptoms), and the 10 items are summed to produce a total score ranging from 0 to 40. The YBOCS has satisfactory reliability and validity., YBOCS was completed at baseline (0 week), and posttreatment (12 weeks). Thereafter YBOCS was administered at 3 months and 6 months follow-up to both treatment groups A and B. YBOCS was administered by a clinical psychologist who was not involved in the study at any stage. The Mini-International Neuropsychiatric Interview (MINI) is a structured clinical interview that assesses the presence of psychiatric disorders. It is comprised standardized closed-ended (Yes–No) questions. It possesses excellent inter-rater reliability, test-retest reliability, and convergent validity (i.e., with the structured clinical interview for diagnostic and statistical manual [SCID]). The instrument requires only 15–45 min to administer, which is substantial briefer than for other structured clinical interviews (e.g., the SCID). The MINI was used to screen for the other psychiatric comorbidities so that the possible participants could be screened out from the study depending on the exclusion criteria. It was used at baseline only. The Beck depression inventory (BDI) is a 21-item self-report scale that assesses the severity of the cognitive, affective, and somatic symptoms of depression experienced during the past week. The BDI has excellent reliability and validity and is widely used in research with clinical and nonclinical samples. The BDI was used to screen out the participants having moderate-to-severe depression from the study. Selected patients with OCD were explained the objective of the study, and written informed consent was obtained. Thereafter, their demographic data were recorded, and YBOCS, MINI, and BDI were administered. After obtaining the baseline data, they were randomly assigned into two treatment groups: SSRI and ILT-based ERP (Group A) and SSRI only (Group B). Patients in Group A were exposed to 12 sessions of psychological treatment individually. Strategies used to maximize the ERP using ILT model  are given in [Appendix 1]. Both groups were also given SSRI medication for 3 months. Doses of fluoxetine for 1st month were 40–60 mg/day and fluvoxamine 50 mg/day, and later modified on the subsequent consultation with psychiatrist. Two participants from Group A left treatment in between and one did not report in follow-ups. Two participants from Group B also left treatment in between. Reasons cited were seeking treatment elsewhere and not interested in treatment anymore. Descriptive statistics measures, such as mean and standard deviation, are used for getting average scores on each group during pre, post, and follow-up periods and analyzing variances. To identify any differences between groups before the treatment, we compared initial scores for the two treatment groups using mean score and independent sample t- test. We used paired t- tests to identify significant within-treatment changes, and independent t- test to identify significant between-treatment changes. To gain a clearer impression of the magnitude of the improvement in OCD symptoms as reflected by YBOCS scores associated with each treatment condition, we calculated pretreatment to posttreatment and follow-up effect sizes for the OCD using Cohen d formula, i.e., the difference in the two groups' means divided by the average of their standard deviations. Result was interpreted on Cohen's suggestion where d = 0.2 is considered a “small” effect size, 0.5 representing a “medium” effect size, and 0.8 a “large” effect size. All statistical calculations are done using SPSS 16 (IBM, USA) software and MS Excel. Total participants are 32 (n = 32), of which 11 are male and 21 female. The mean age of the sample was 25.4 (±3.60) years. Educational level varied from under matriculation to postgraduate level (under matriculation: 3; Intermediate: 6; and Graduation or higher: 23). On Shapiro–Wilk normality test, data seem to be normally distributed (P = 0.01) = 0.89 and (P = 0.05) = 0.92. Data also seem homogeneous at Levene's test of homogenity (No significant difference between means - 0.29). As shown in [Table 1], at baseline, mean scores of two treatment groups are not significantly different. Hence, participants did not differ significantly in OCD dimensions before intervention and belong to the same representative population. As shown in [Table 2], in comparison to pretreatment and posttreatment within Treatment A Group (after 3 months of intervention), there is a mean difference in PO measure of YBOCS is 13.36, standard deviation (SD) is 6.62, and P value is 0.01 indicating that there is a highly significant difference between the two compared means. Effect size calculated using Cohen's d formula, is 2.01, which reflects high magnitude of the improvement. Hence, there is a significant treatment effect on the YBOCS measured using combined treatment method of SSRI plus ILT-based ERP at posttreatment. At follow-up (3 months to posttreatment), the mean difference in PO is 13.69, SD is 4.78, and P value is 0.01, indicating that there is a highly significant difference between two compared means. Hence, there is a significant maintenance of treatment effects on the YBOCS measured by combined treatment method of SSRI plus ILT-based ERP. At follow-up (6 months to posttreatment), the mean difference in PO is 13, SD is 5.35, and P value is 0.1, indicating that there is a highly significant difference between two compared means. Hence, there is a significant maintenance of treatment effects on the PO measured using combined treatment method of SSRI plus ILT-based ERP. As shown in [Table 3], in comparison to pre and posttreatment within Treatment A Group (after 3 months of intervention), there is a mean difference in PO measure of YBOCS is 8.7, SD is 4.1, and P value is 0.01, indicating that there is a highly significant difference between two compared means. Effect size, using Cohen's d formula, is 2, which reflects high magnitude of the improvement. Hence, there is a significant treatment effect on the YBOCS measured by the treatment of SSRI at posttreatment. At follow-up (3 months to posttreatment), the mean difference in PO is 7.5, SD is 3.08, and P value is 0.01, indicating that there is a highly significant difference between two compared means. Hence, there is a significant maintenance of treatment effects on the YBOCS measure by the treatment of SSRI at follow-up. At follow-up (6 months to posttreatment), the mean difference in PO is 6.7, SD is 3.58, and P value is 0.1 indicating that there is a highly significant difference between two compared means. Hence, there is a significant maintenance of treatment effects on the PO measured by the treatment of SSRI at longer follow-ups. As shown in [Table 1], in comparison to baseline scores of both A and B groups, using independent t-test, P value in Levene's test of equality of variances and t-test are 0.29 and 0.26, respectively, indicating that there is no significant difference between two means before treatment and they are from same population. As shown in [Table 1], in comparison to posttreatments of both A and B groups (after 3 months of intervention), the mean scores are 13.86 and 20, but SD are 3 and 4.93, respectively, which indicates Group A received more treatment effects; however, variances are highly present and not equally distributed. Means some responded very well and some not. In [Table 1], P value is. 102 indicating that there is no significant difference between two compared means. Hence, there is no significant difference in the treatment effect between combined treatment method of ILT-based ERP plus SSRI and SSRI alone at immediate posttreatment. In comparison to the follow-up of 3 months of posttreatments of both A (mean = 13.46; SD = 3.2) and B (mean = 21.21, SD = 3.09) groups, P value is. 01 indicating that there is a highly significant difference between two compared means. Hence, there is a significant difference in the treatment effect between combined treatment methods of ILT-based ERP plus SSRI and SSRI alone at follow-up. In comparison to the follow-up of 6 months of posttreatments of both A (mean = 14.15; SD = 3.8) and B (mean = 22, SD = 3.39) groups, P value is 0.01 indicating that there is a highly significant difference between two compared means. Hence, there is a significant difference in the treatment effect between combined treatment methods of ILT-based ERP plus SSRI and SSRI alone at longer follow-up. The overall pattern of results indicates that both ILT-based ERP with SSRI and SSRI alone are effective treatments for OCD. 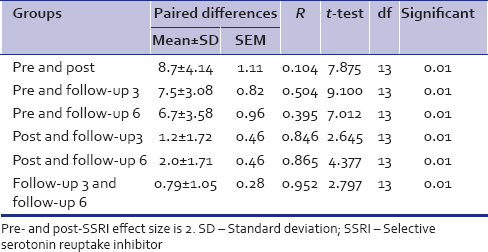 If we compare these effects with studies which have used SSRI plus ERP, the improvement in posttreatment measure was not surprising given the established efficacy of augmentation studies across literatures., Hence, the present study also supports the augmentation of combined SSRI plus ERP as an effective treatment. However, no significant difference in treatment effects between combined treatment of ILT-based ERP plus SSRI and SSRI alone in immediate postassessment was found. If we analyze the mean score, we can see that in immediate postassessment, the ILT-based ERP got better treatment effects; however, the SD of the combined treatment group in postassessment is 4.93 as compared to 3.09 which possibly indicates that some of the participants fared much better than other in the combined treatment group, and these variances are not equally distributed. Some possible reasons behind this are noted in the limitations part. Both treatment groups also showed the maintenance of treatment effects over 6 months of follow-up. Interestingly, when we compare the level of significance results across various time frames regarding follow-up in both treatment groups, we see that ILT-based ERP + SSRI group has better maintenance of treatment effects and show better result over long duration than SSRI alone treatment group. 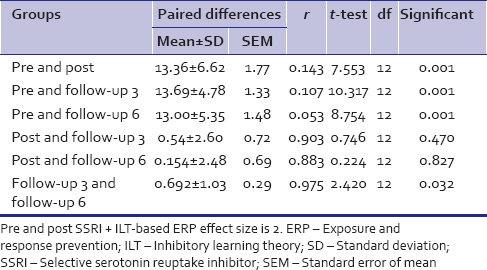 The present study has supported the theoretical proposition of ILT-based ERP model that it helps in consolidation and retrieval of learned information during exposure (CS does not leads to US, the inhibitory learning), which helps nonreturn of fear as opposed to EPT-based ERP model where studies have find 50%–60% experience at least partial relapse at later follow-up., However, in the present study, if we analyze the mean score of Treatment A in various follow-up, it is almost similar. Hence, it may be argued that ILT-based ERP in combination with SSRI may have better long-term effects than SSRI alone and perhaps combined treatment of EPT-based ERP with SSRI. However, to strongly comment on later finding, direct comparison of both models of ILT and EPT models of ERP has to be done in future studies. Numerous controlled and uncontrolled studies conducted in various centers worldwide have established ERP (and CBT more broadly) as a highly effective treatment for OCD., All the above-mentioned studies used EPT-based ERP in contrast to the present study where the optimization model of ILT was used. Very few studies in literature have evaluated the efficacy of ILT-based optimization techniques in ERP. However, the findings of the present study clearly indicate that ILT-based ERP is also effective in the treatment of OCD. One limitation was that the sample size was relatively small, which may have led to insufficient power to detect differences between two active treatments and failure to replicate all findings of previous studies. The present study has utilized both fluoxetine and fluvoxamine in Treatment Group B while some study has carried out with only one type of SSRI for better generalization. A few ERP treatment sessions were delivered by relatively less experienced mental health students whereas the majority are done by more experienced professionals, which may be a possible reason of large variances seen in within combined treatment group of SSRI plus ILT-based ERP. Although this is common to many clinical trials and expert supervision was provided, the findings may have differed with more experienced clinicians. One of the major drawbacks is intent to treat approach was not used for statistical analysis. The present study carried out two treatment groups, ILT-based ERP + SSRI and SSRI alone. Rather only comparing it with SSRI alone, a direct comparison of ILT-based ERP with another treatment group consisting EPT-based ERP could have brought more robust differences or similarities between both. In sum, this study adds to the small but growing body of evidence indicating that combined ILT-based ERP plus SSRI is effective in treatment of OCD. In contrast to earlier studies, it is found that there is no significant difference in treatment effects between combined treatments of ILT-based ERP plus SSRI with SSRI alone in immediate postassessment. However, ILT-based ERP + SSRI treatment effects are maintained for longer period than SSRI alone treatment. Foa EB, McNally RJ. Mechanisms of change in exposure therapy. In: Rapee RM, editor. Current Controversies in the Anxiety Disorders. New York: Guilford Press; 1996. p. 214-27. Kozak MJ, Foa EB. Mastery of Obsessive-Compulsive Disorder: A Cognitive-Behavioral Approach Therapist Guide. 1st ed. New York: Oxford University Press; 1997. Craske MG, Liao B, Brown L, Vervliet B. Role of inhibition in exposure therapy. J Exp Psychopathol 2012;3:322-45. Craske MG, Kircanski K, Zelikowsky M, Mystkowski J, Chowdhury N, Baker A, et al. Optimizing inhibitory learning during exposure therapy. Behav Res Ther 2008;46:5-27. Foa EB, Liebowitz MR, Kozak MJ, Davies S, Campeas R, Franklin ME, et al. Randomized, placebo-controlled trial of exposure and ritual prevention, clomipramine, and their combination in the treatment of obsessive-compulsive disorder. Am J Psychiatry 2005;162:151-61. Norberg MM, Calamari JE, Cohen RJ, Riemann BC. Quality of life in obsessive-compulsive disorder: An evaluation of impairment and a preliminary analysis of the ameliorating effects of treatment. Depress Anxiety 2008;25:248-59. Eisen JL, Sibrava NJ, Boisseau CL, Mancebo MC, Stout RL, Pinto A, et al. Five-year course of obsessive-compulsive disorder: Predictors of remission and relapse. J Clin Psychiatry 2013;74:233-9. Simpson HB, Franklin ME, Cheng J, Foa EB, Liebowitz MR. Standard criteria for relapse are needed in obsessive-compulsive disorder. Depress Anxiety 2005;21:1-8. Loerinc AG, Meuret AE, Twohig MP, Rosenfield D, Bluett EJ, Craske MG, et al. Response rates for CBT for anxiety disorders: Need for standardized criteria. Clin Psychol Rev 2015;42:72-82. Baker A, Mystkowski J, Culver N, Yi R, Mortazavi A, Craske MG, et al. Does habituation matter? Emotional processing theory and exposure therapy for acrophobia. Behav Res Ther 2010;48:1139-43. Meuret AE, Seidel A, Rosenfield B, Hofmann SG, Rosenfield D. Does fear reactivity during exposure predict panic symptom reduction? J Consult Clin Psychol 2012;80:773-85. Bouton ME, Brooks DC. Time and context effects on performance in a Pavlovian discrimination reversal. J Exp Psychol Animal Behav Process 1993;19:165. Myers KM, Davis M. Mechanisms of fear extinction. Mol Psychiatry 2007;12:120-50. Bouton ME, Woods AM, Pineño O. Occasional reinforced trials during extinction can slow the rate of rapid reacquisition. Learn Motiv 2004;35:371-90. Sotres-Bayon F, Cain CK, LeDoux JE. Brain mechanisms of fear extinction: Historical perspectives on the contribution of prefrontal cortex. Biol Psychiatry 2006;60:329-36. Quirk GJ. Memory for extinction of conditioned fear is long-lasting and persists following spontaneous recovery. Learn Mem 2002;9:402-7. Rescorla RA, Heth CD. Reinstatement of fear to an extinguished conditioned stimulus. J Exp Psychol Anim Behav Process 1975;1:88-96. Ricker ST, Bouton ME. Reacquisition following extinction in appetitive conditioning. Animal Learn Behav 1996;24:423-36. Goodman WK, Price LH, Rasmussen SA, Mazure C, Delgado P, Heninger GR, et al. The Yale-Brown obsessive compulsive scale. II. Validity. Arch Gen Psychiatry 1989;46:1012-6. Nakagawa A, Marks IM, Takei N, Araujo LA, Ito LM. Comparison among the Yale Brown Obsessive Compulsive Scale, compulsion checklist, and other measures of obsessive compulsive disorder. Br J Psychiatry 1996;169:108-12. Sheehan D, Lecrubier Y, Harnett Sheehan K, Janavs J, Weiller E, Keskiner A, et al. The validity of the Mini International Neuropsychiatric Interview (MINI) according to the SCID-P and its reliability. Eur Psychiatry 1997;5:232-41. Cohen J. Statistical Power Analysis for the Behavioral Sciences. 2nd ed. Hillside NJ: Lawrence Erlbaum Associates; 1988. Tolin DF, Maltby N, Diefenbach GJ, Hannan SE, Worhunsky P. Cognitive-behavioral therapy for medication nonresponders with obsessive-compulsive disorder: A wait-list-controlled open trial. J Clin Psychiatry 2004;65:922-31. Simpson HB, Foa EB, Liebowitz MR, Ledley DR, Huppert JD, Cahill S, et al. A randomized, controlled trial of cognitive-behavioral therapy for augmenting pharmacotherapy in obsessive-compulsive disorder. Am J Psychiatry 2008;165:621-30. Eddy KT, Dutra L, Bradley R, Westen D. A multidimensional meta-analysis of psychotherapy and pharmacotherapy for obsessive-compulsive disorder. Clin Psychol Rev 2004;24:1011-30. Foa EB, Kozak MJ. 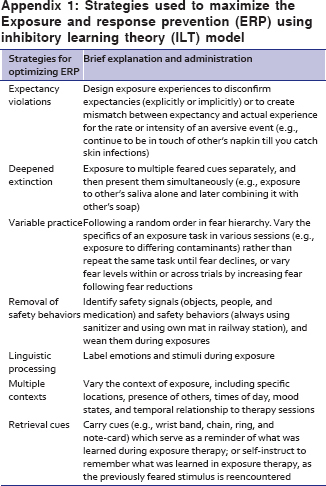 Emotional processing of fear: Exposure to corrective information. Psychol Bull 1986;99:20-35. Abramowitz JS, Arch JJ. Strategies for improving long-term outcomes in cognitive behavioral therapy for obsessive-compulsive disorder: Insights from learning theory. Cogn Behav Pract 2014;21:20-31. Olatunji BO, Davis ML, Powers MB, Smits JA. Cognitive-behavioral therapy for obsessive-compulsive disorder: A meta-analysis of treatment outcome and moderators. J Psychiatr Res 2013;47:33-41. Craske MG, Treanor M, Conway CC, Zbozinek T, Vervliet B. Maximizing exposure therapy: An inhibitory learning approach. Behav Res Ther 2014;58:10-23. Arch JJ, Abramowitz JS. Exposure therapy for obsessive – Compulsive disorder: An optimizing inhibitory learning approach. J Obsessive Compuls Relat Disord 2015;6:174-82.